“Other than food, we also have Tasek Merimbun here, which has been declared as one of the Asean National Heritage sites since 1984, Brunei’s largest blackwater lake with an area of 220 hectares; a refreshing waterfall at the Wasai Bedanu Recreational Park; the Batu Mapan Recreational Park; and a beautiful beach at Seri Kenangan, which is set on a sliver of land, with the South China Sea on one side and the Tutong District on the other, with arguably one of the best spots for sunsets in Brunei. Dato Seri Setia Awang Haji Ali then cited the district’s leading local produce, such as the stingless bee honey from the Tasbee Meliponiculture Farm, the herbal tea of Kampong Kiudang, and the sago and virgin coconut oil from Kampong Tanjong Maya, while encouraging all those present to explore what Tutong District has to offer. He also encouraged airlines, hotels and travel agents to collaborate with these tour product providers to add more variety and choice to their existing tour programmes. “This is vital in making Tutong District as another main tourist destination in Brunei Darussalam,” he said. The minister then concluded his speech on the hope that with more arrivals through chartered flights from China, and by providing exciting tour options, visitors would choose to stay longer in Brunei and further contribute to the economy. TUTONG District held a launching of eight package tours yesterday, including the ‘2 Days and 1 Night’ and ‘Day Trip’ packages, with the aim of showcasing hotspots and site attractions to draw more local and international tourists into the district. The event was officiated by Dato Seri Setia Awang Haji Ali bin Haji Apong, Minister of Primary Resources and Tourism, in a ceremony at the Pekan Tutong Jetty. Also present at the launch were several members of the Legislative Council, permanent secretaries, foreign ambassadors and diplomatic corps, members of the Brunei Tourism Board, Tutong District Officer, penghulus and village heads as well as Tutong Tourism Service Providers. The promotion of the ‘Tutong Destination Packages’ is a collaborative effort between the Tourism Development Department of the Ministry of Primary Resources and Tourism and the Tutong District Tourism Promotion and Coordination Body to step up on existing efforts to boost package tours in the country. The eight new packages comprise the Tutong Thursday Market; Tutong Cottage Industry Tour; Experience Tutong Culture; Experience Kiudang Day Trip; Back to Nature; Tutong River Cruise; 2 Days and 1 Night package; Explore Tutong Package; and the 2 Days, 1 Night Village Package. The signing of a Memorandum of Understanding (MoU) between the travel agency, Hasa Incentives Sdn Bhd, with the Kampong Rambai Village Consultative Council committee and Puteri Maya Enterprise, as well as between Sinar Tour Sdn Bhd and a boat entrepreneur, Sri Melati Enterprise was also held. According to statistics gathered by the Tutong District Tourism Promotion and Coordination Body in 2016, 1,680 people visited various places of interest in the Tutong District. From that number, 450 used tour packages while the rest were Frequent Independent Travellers (FITs). The numbers also showed that 70 per cent were local visitors, 25 per cent were foreign tourists, while the remaining five per cent composed mainly of school visits and research students. 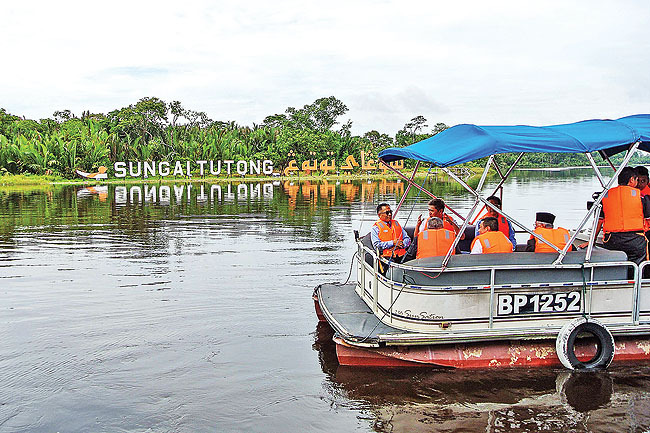 Up until July this year, approximately 1,085 visitors bought tour packages either through the Tutong District Tourism Promotion and Coordination Body or travel agents. From these figures, 63 per cent were locals; 25 per cent foreigners; and 12 per cent students, researchers and official visits. According to the Tourism Development Department, among the popular packages were the Tutong City Tour, the Tutong Cottage Industry Tour, the Tutong Educational Tour and the Tutong Islamic Tour. Currently, the most popular packages for 2017 are the Kiudang Tour and Tutong City Tour. During yesterday’s launching ceremony, several booths were set up, showcasing tourism products under the village consultative councils in Tutong District. The product operators involved in the creation of the Tutong Destination Packages also participated in the event. Members of the Brunei Tourism Board, along with some foreign ambassadors, were later given the opportunity to experience the Tutong River Cruise Package, which includes a scenic view of Pekan Tutong and an area called Lurah Saban, which was an early settlement of the Tutong people. The new Tutong Destination Packages add variety to the tour packages currently offered by travel agents. According to the Tourism Development Department, this should benefit tourists by offering them more choices, while encouraging them to extend their stay in Brunei.